You are here: Home > Stories > Water your young trees! Update: This story is originally from 2016, but the same conditions are starting to prevail. It is very likely that your young trees need water. We are having a spell of beautiful weather, at least for people. This weather may be fine for people, but it can be stressful to trees. Trees lose more water from their leaves when humidity is low. If the soil is dry, the trees may soon wilt or die back. Even without obvious wilting, trees may be stressed. We have had plenty of rainfall, and are not currently in drought. 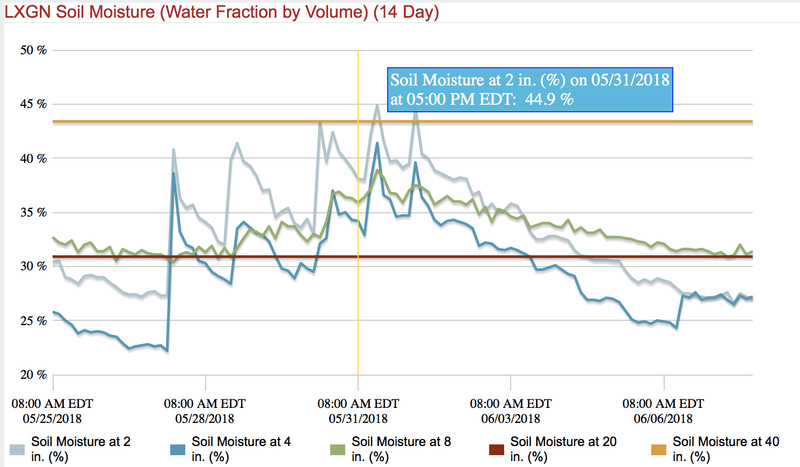 As the graph shows at the end of the article shows, soil near the surface has become very dry. This is the problem for newly planted trees - they are not yet firmly established in the deeper layers of soil where moisture is plentiful. The risk to trees is compounded by our wet spring. 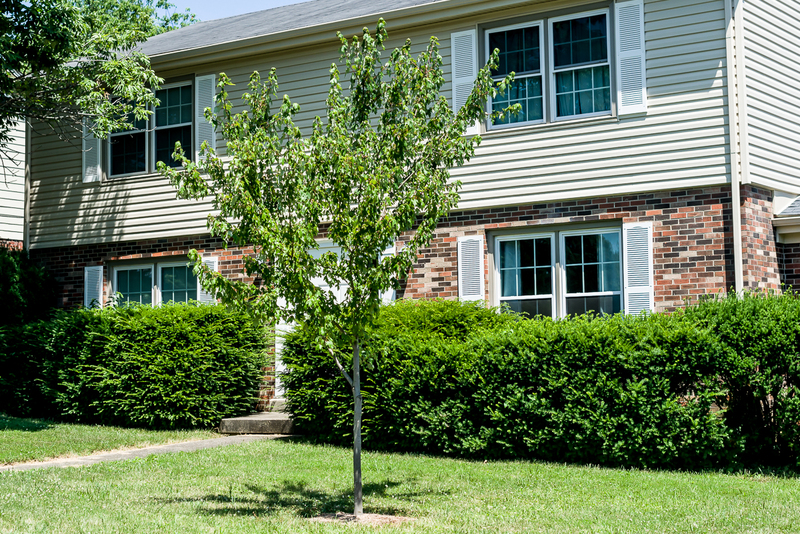 In wet conditions, roots tend to form near the soil surface, and when dry conditions replace the wet spring, trees can quickly become stressed. We can see this all over Lexington - and it is true in many other eastern cities as well. Newly established trees are wilting. If current weather patterns continue, many more trees will begin to suffer. Some will be stressed enough to eventually die. Many landowners have spent a lot of money planting trees, but their investment will be lost if trees are stressed. 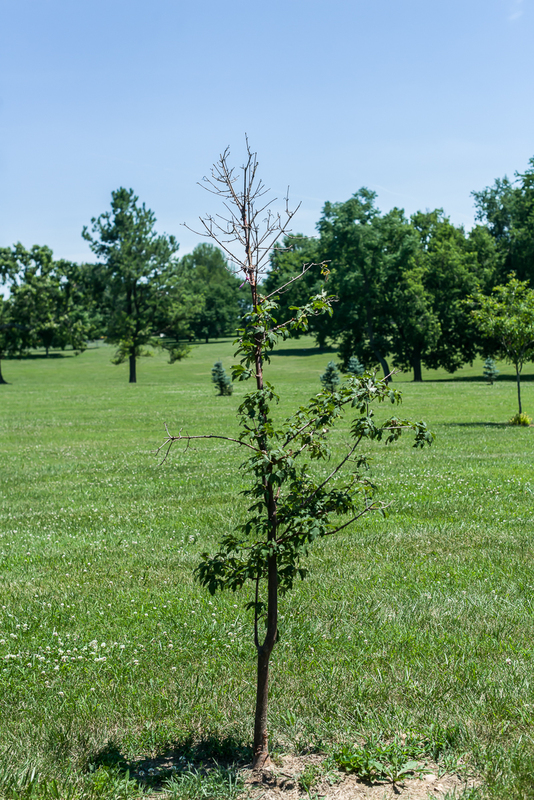 For larger landowners, including city governments, water stress in newly planted trees can result in the loss of thousands of dollars for planted trees that don't survive or thrive. You need to water your young trees, but you don't want to waste water. Instead of watering on a schedule, let the soil tell you when to water. The easiest way to know when to water trees is to use a trowel to dig a small hole near the tree. If the soil feels dry, it is time to water. How should you water? It is not sufficient just to water your lawn - for trees, soil needs to be watered deeply. 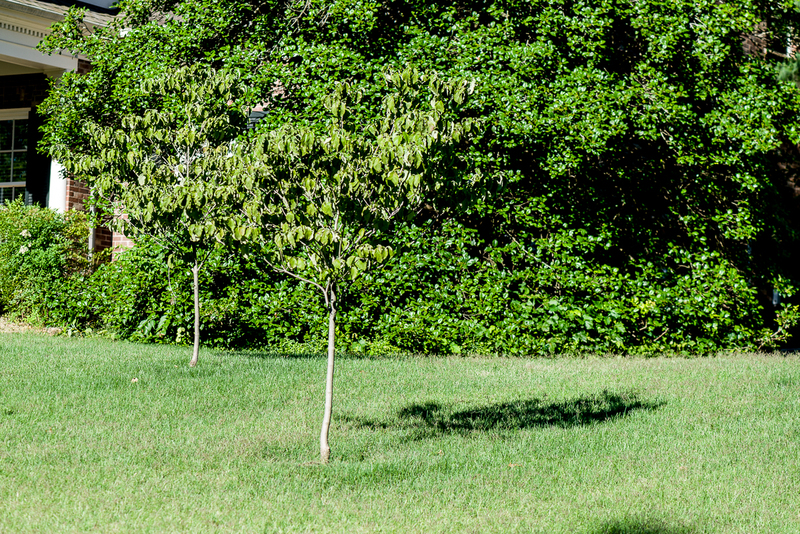 Irrigation systems often do not provide deep enough watering for trees. Drip irrigation is very effective, but is costly and can require a lot of maintenance. It is easy to water your trees with a hose. Place the hose end at the base of the tree and turn it on to a trickle for an hour or two. This method often results in overwatering and wasting water, especially if you are forgetful. Another way to ensure that your valuable trees get adequate water is to use a 5-gallon bucket, available at most hardware stores. Poke a nail hole in the bottom of the bucket, put it next to your trees (but not touching the tree) and fill it with water. Refill the bucket once or twice a week. Here is a good video on watering. Another solution is to use a watering device like a Treegator. This is a bit more expensive but provides excellent results if done properly. The bags slowly leak water into the soil, watering deeply and effectively. The bags have to be refilled at least weekly, and this is often a problem. I have seen Treegators that were not refilled for months - as if they had magic properties. If properly used, Treegators are very effective and will last for years. Be sure to remove and store that Treegator when the watering season is finished. Some people find Treegators unsightly. There is another solution for small trees called the Treegator Jr. that is less visible, looking like a small donut around your tree. Whatever method you use, it is also important to choose the right tree for the right site. Dogwood trees never do well in full sun. No matter how much you water the tree, it will lose water faster than it can take it up. Dogwoods in full sun may look nice for a couple of weeks when they are in flower, but most of they year they look droopy and stressed. Red maples also do poorly in very sunny locations, though they may recover after a rain. Young tree with a dead top due to water stress. 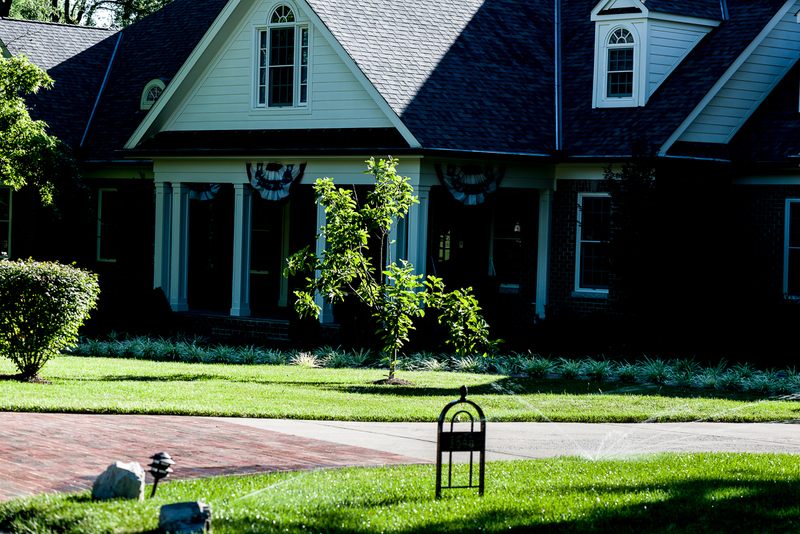 Irrigation systems often don't adequately water trees. Dogwoods never do well in full sun, even if watered. 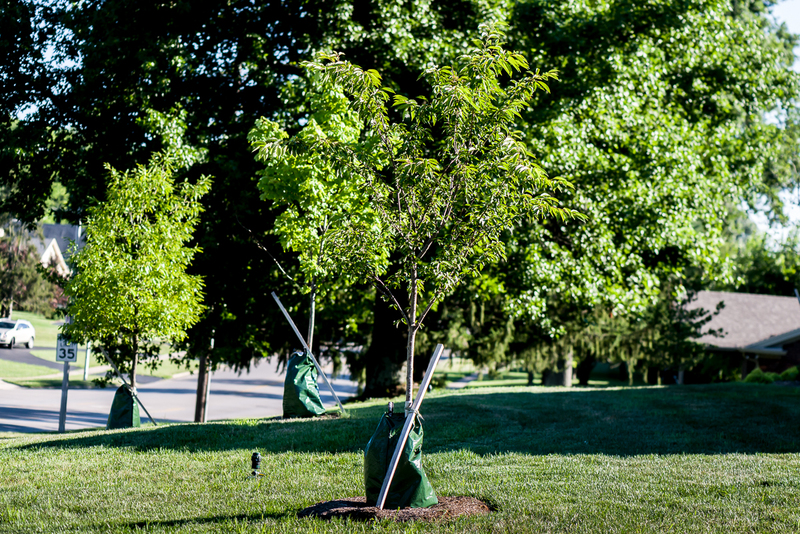 Newly planted trees with Treegator controlled watering bags. Posted in News and tagged drought, Trees, Urban forestry, water stress.